Let's talk trackers! I think this is the part of bullet journaling that drew me to the whole community. Seeing all the unique and interesting ways that people were keeping track of their lives really intrigued me, especially since often the trackers that people created are also so creative. So, where do trackers come in? Everywhere! 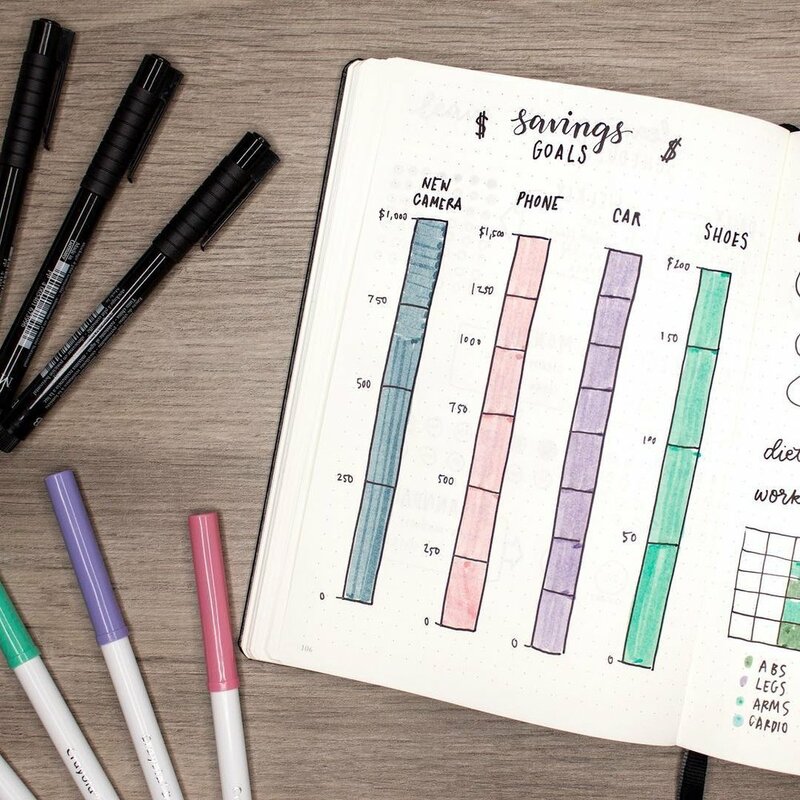 But for the purposes of your bullet journaling lesson, you can introduce trackers once you've set up your annual overview and are clear on the goals you want to achieve. I'll begin by explaining what I have just now dubbed the "Yearly Trackers" (also a cool name for a band), and then we'll talk about some awesome Monthly & Weekly Trackers (not quite as cool a name for a band). Yearly trackers allow you to see whatever it is you're tracking in one space so you can compare different months or make notes of achievements in one space throughout the year. So I'm talking savings plans, books you've read, menstrual cycle tracker, etc. Think of the yearly trackers as helping you to keep track of the admin of your life. Monthly trackers are the things you want to keep a measure of each month. These are things you want to consistently get better at each month, or keep in mind on a regular basis. Your habits, gratitudes, workouts, eatings plans, budget, cleaning schedules etc. Think of monthly trackers as the tools that will help you to be more mindful about your life. And lastly, Weekly trackers. These are the items you can keep track of on a weekly basis, that don't necessarily take up a lot of space in your weekly/daily bullet journal log (see the post on logs if you don't know what a weekly/daily log is) or are a little bit tricky to fit into your bujo on a yearly/monthly basis. So this can be things like sleep trackers, water in-take, weather, meal plans, weekly reviews etc. Note, this is just the method I've used for my bullet journal. What I treat as weekly trackers, you might find works better as a monthly tracker or annual tracker. And vice versa. And versa vice. So often throughout my bullet jounaling journey, I have migrated what I initially treated as annual trackers into monthly and even into weekly trackers and back again. It all depends on the purpose of your journal, what works for you in general, your mood and, honestly, sometimes just an inspiring layout you saw from someone else's bujo. This is just a guide. So mix and match. Play with layouts. Build the bujo that best suits your life. Draw inspiration from everywhere and everyone. That's how we all got started. So tell me, what area of your life would you like to keep better track of and what type of tracker would you use to do it?